Yesterday, while reading an article on USA Today, my eyes gazed over to prominently displayed “News Stories” on the right side of the page. Clicking through seems to reach respectable site, apparently presenting TV affiliated news site, complete with anchor photos, videos and long authentic looking article. Except all of that is just an elaborate scheme to try and get gullible consumers to trust this fabricated article. 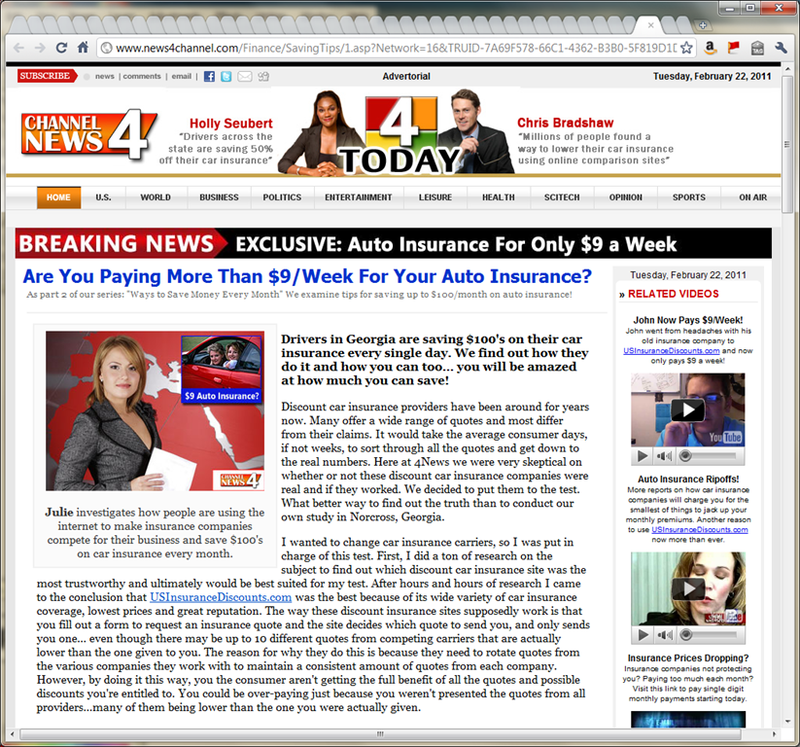 Fancy backend algorithm generates random people names (sometimes for same photos, as I confirmed clicking on similar Ads from another page) and even articles themselves change depending on the area your IP is coming from, to try and get you to think that local reporter is bringing you this important news “information”. Of course the content of the article itself is also mostly fake, and so are all the other links on the page, purporting to be other categories of this “news site”. In reality, these links are just a cheap-trick, redirecting people to unsuspecting sites which are probably paying for “click through”, hoping for quality leads but instead getting ripped. In one of the links I landed on a site claiming to be New-York’s WSVI television station. Of course in reality it is just another site scammers generated, and I wonder what real ABC affiliated WSVI station, which actually broadcasts in Virgin Islands, would say about this? The wares they are peddling are suspicious or worse. The Work-At-Home scam is especially nefarious and I found earlier reference to similar tactics, even infringing on CNN’s trademark logo. I am pretty sure the $5 cream they are peddling is either unsafe for your skin, or completely inert. And the $9 a week miraculous Insurance they are promising – I calculated that I pay less with respectable Travelers insurance, instead of their “unidentified” company. 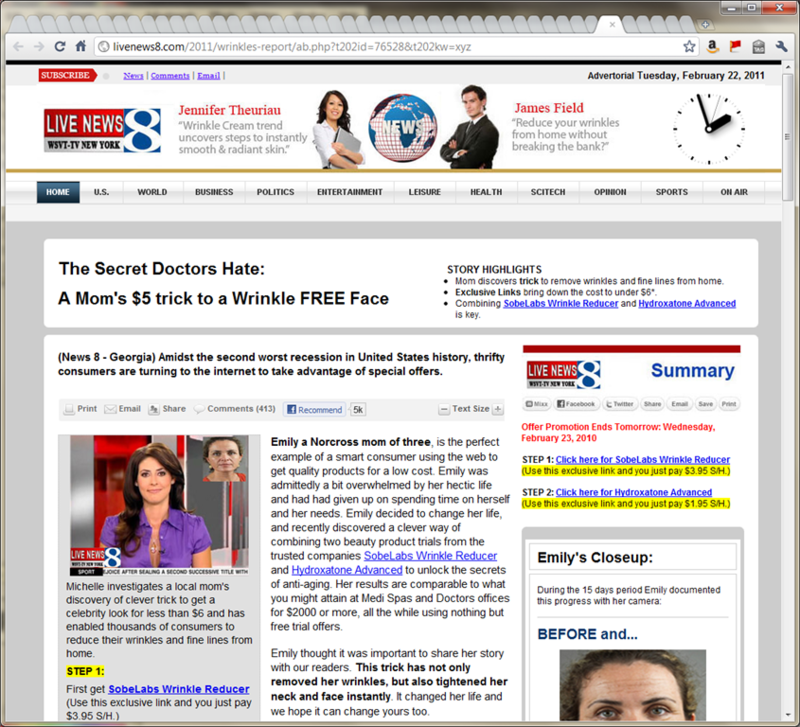 How can (supposedly) respectable USA Today newspaper and online site stoop to such low quality advertisement sham? I literally felt that I need to run and tell my children about yet another evil on this planet that they need to protect themselves from. But I also tried to take a step back and consider if I am overreacting. Perhaps this is the future of online Advertising? Should we just adjust our expectations that anything and everything we click on the web may end up directing us to Insurance site (regardless if we have a car) or maybe Viagra-like cheap pills offer (regardless of….). After all, how else are quality sites like USA Today can support their staff of professional journalists? We always knew that everything we find on the Internet cannot be trusted, right? Why would we ever use Wikipedia at all? You have to draw your own conclusion, and talk to your own kids. Meanwhile I am uninstalling USA Today app from my iPhone and will think twice before clicking on any link leading to USA Today site – I hope the advertising revenue they got from AdBlade was worth losing all those readers over. Great post Adi. And thanks for clicking through the junk ads. I’ve always wanted to do that just for the heck of it but never bothered. I agree mainstream media has no business displaying such sham ads and just because they are automatically generated does not give them a pardon. However, I would like to point out this is the very reason I prefer to use Wikipedia to satisfy my knowledge hunger. At least I ALREADY know the potential for error there. I know I have cross reference that information. But I also know Wikipedia entries are in no way beholden to or dependent on advertising revenue. In a strange, ironic way, it actually makes them MORE trustworthy than USA today. Thanks for your comment! I definitely visit Wikipedia a lot and have donated to the foundation in the past. Yet somehow there is no avoiding the news sites for me, as they report directly on the events happening currently.